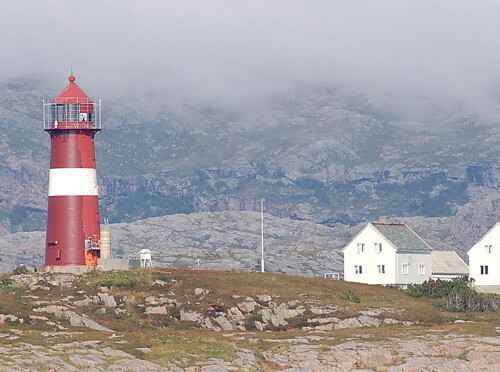 This page lists lighthouses of the municipalities of Flatanger, Namsos, Åfjord, Roan and Osen on the central coast of Trøndelag County north of Trondheim. Navigational chart information for this section of the chart. Date unknown. Active; focal plane 8 m (26 ft); white, red or green light depending on direction, 3 s on, 3 s off. 8 m (26 ft) lantern supported by piles. Lantern painted white with a red roof. No photo available, and Google has only a distant satellite view. This was originally the rear light of the Oterskjæret Range. Located on a skerry about 6 km (3.5 mi) west of Villa. Accessible only by boat. Site open, tower closed. NF-5015; Admiralty L1726; NGA 8528.1. Date unknown. Active; focal plane 21.5 m (71 ft); flash every 5 s, white, red or green depending on direction. 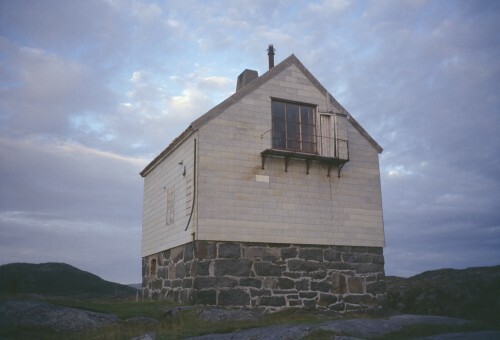 6 m (20 ft) square skeletal tower, covered with siding, with lantern and gallery. Lighthouse painted white, lantern roof red. No photo available, but Bing has a satellite view. Located on the southwestern point of Kvaløya, an island off Flatanger. Accessible only by boat. Site status unknown. NF-5050; Admiralty L1732; NGA 8564. Date unknown. Active; focal plane 7 m (23 ft); white, red or green light depending on direction, 3 s on, 3 s off. 6 m (20 ft) lantern mounted on a platform supported by piles. Lantern painted white with a red roof. No photo available, but Bing has a satellite view. Located on a skerry about 1 km (0.6 mi) west of Villa. Accessible only by boat. Site open, tower closed. NF-5062; Admiralty L1737; NGA 8580. 1839. Inactive since 1890. 15 m (49 ft) hexagonal cylindrical granite tower; an observation room has been built atop the tower. The tower is unpainted stone. Eirik Solheim's photo is at right, Lars Forseth has a 2006 photo, a 2008 photo is available, Flatanger Kommune has a page for the lighthouse, and Google has a satellite view. 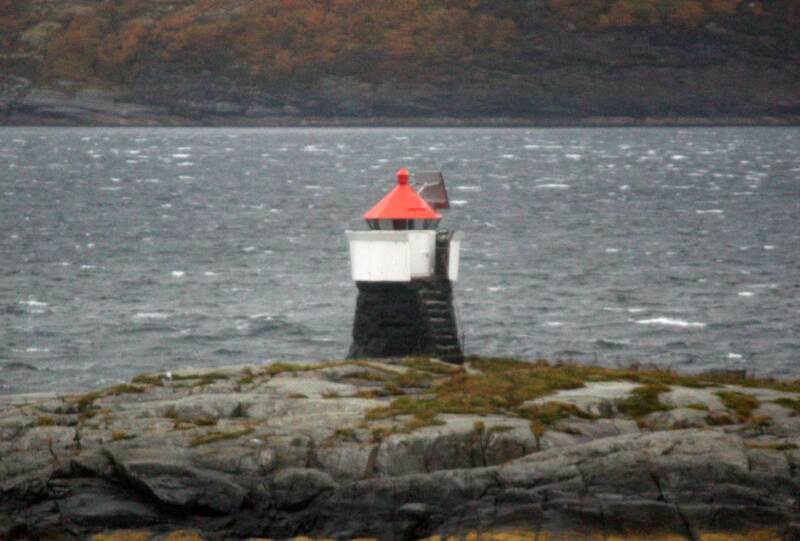 This was the first lighthouse built north of Trondheimfjord. It was designed to burn coal and did so until it was converted to oil in 1859. A friends group, Villa Fyr Venneforening, was formed in 1976 and signed an agreement with the Kystverket to take over management of the building. Ownership was transferred to Flatanger Kommune in 2005. An assistant keeper's house has been renovated for overnight accommodations. The restoration seen in Solheim's photo took place in 2015; a modern observation room was added atop the tower. Located on an island off Flatanger. Accessible only by boat. Site and tower open. Owner: Flatanger Kommune. Site manager: Villa Fyr Venneforening. ARLHS NOR-276. 1888. Inactive since 2001. 10 m (33 ft) 1-1/2 story wood keeper's house. The house is painted white. The light was shown through the window seen in the Culture Ministry photo at right. Google has a satellite view. The station was purchased by Flatanger Kommune in 2005, and accommodations are now available. Located on the north coast of Byørøy, marking the passage between that island and Ellingen, about 5 km (3 mi) northwest of Lauvsnes. Site open, tower closed. Owner: Flatanger Kommune. Site manager: Ellingråsa Lighthouse Lodge. ARLHS NOR-071. Date unknown. Active; focal plane 22 m (72 ft); white, red or green light depending on direction, 4 s on, 2 s off. 6 m (20 ft) square skeletal tower, covered with siding, with lantern and gallery. Lighthouse painted white, lantern roof red. The Lighthouse Lodge has photos showing the new lighthouse. Located in front of the historic building. Site open, tower closed. Site manager: Ellingråsa Lighthouse Lodge. NF-5091; Admiralty L1750; NGA 8672. Date unknown. Active; focal plane 9 m (30 ft); white, red or green light depending on direction, 3 s on, 3 s off. 6 m (20 ft) square skeletal tower, covered with siding, with lantern and gallery. Lighthouse painted white, lantern roof red. No photo available, but Google has a satellite view. Located on the northwest point of Feøy. Accessible only by boat. Site open, tower closed. NF-5090; Admiralty L1749; NGA 8668. Date unknown. Active; focal plane 5.5 m (19 ft); white, red or green light, depending on direction, occulting twice every 8 s. 6.5 m (21 ft) lantern supported by piles. Lantern painted white with a red roof. No photo available, but Bing has a distant satellite view. Located on a reef off the north coast of Asholmen. Accessible only by boat. Site open, tower closed. NF-5097; Admiralty L1756; NGA 8684. Date unknown. Active; focal plane 16.5 m (54 ft); flash every 5 s, white, red or green depending on direction. 6 m (20 ft) skeletal tower with lantern and gallery. Lantern painted white with a red roof. Petter Hamnes has a distant photo, and Bing has a distant satellite view. Located on a small island about 6.5 km (4 mi) northeast of Utvorda. Accessible only by boat. Site open, tower closed. NF-5105; Admiralty L1764; NGA 8692. Date unknown. Active; focal plane 7 m (23 ft); white, red or green light depending on direction, 3 s on, 3 s off. 6 m (20 ft) square skeletal tower with lantern and gallery, covered with siding. Lighthouse painted white; lantern roof is red. No photo available, but Bing has a distant satellite view. Located on Brandøy, an island in the Lyngynfjord, marking the entrance to Bangsund. Accessible only by boat. Site open, tower closed. NF-5122; Admiralty L1774; NGA 8708. Date unknown. Active; focal plane 7 m (23 ft); two flashes every 5 s, white, red or green depending on direction. 4 m (13 ft) lantern on a stone base with snow screen. Lantern painted white with a red roof. Erik Stenvik has a distant view from Namsos, and Bing has a distant satellite view. Located on a promontory on the south side of the Namsen sound, about 1.6 km (1 mi) south of the Namsos waterfront. Site status unknown. NF-5124; Admiralty L1775. Date unknown. Active; focal plane 7.5 m (25 ft); white, red or green light depending on direction, occulting twice every 8 s. 6 m (20 ft) lantern mounted on a platform supported by piles. Lantern painted white with a red roof. No photo available, but Bing has a distant satellite view. Located on a skerry in the Surviksfjord. Accessible only by boat. Site open, tower closed. NF-5130; Admiralty L1778; NGA 8716. Date unknown. Active; focal plane 6 m (20 ft); white, red or green light depending on direction, 3 s on, 3 s off. 6 m (20 ft) square tower with lantern and gallery. Lighthouse painted white; lantern roof painted red. No photo available, but Bing has a distant satellite view. Located on a skerry on the north side of the Åfjord about 1.6 km (1 mi) southwest of Monstad. Accessible only by boat. Site open, tower closed. NF-4805; Admiralty L1628; NGA 8332. Date unknown. Active; focal plane 6 m (20 ft); white, red or green light depending on direction, 3 s on, 3 s off. 7 m (23 ft) lantern and gallery supported by piles. Lantern painted white with a red roof. Trabas has Boucher's photo, and Google has a satellite view. Located on a skerry about 1.6 km (1 mi) west of Lauvøy. Accessible only by boat. Site open, tower closed. NF-4794; Admiralty L1616; NGA 8316. Date unknown. Active; focal plane 5 m (17 ft); white, red or green light depending on direction, 3 s on, 3 s off. 7 m (23 ft) lantern and gallery supported by piles. Lantern painted white with a red roof. No photo available, but Google has a satellite view. 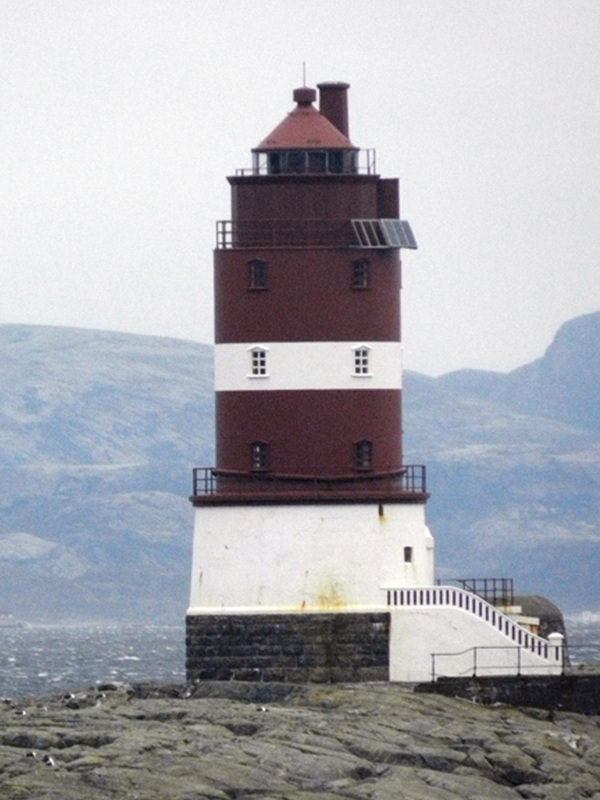 Located on a shoal off the northeastern tip of Lauvøy. Accessible only by boat. Site open, tower closed. NF-4810; Admiralty L1630; NGA 8336. Date unknown. Active; focal plane 7.5 m (25 ft); white, red or green light depending on direction, occulting twice every 8 s. 8 m (26 ft) square skeletal tower with enclosed upper portion, lantern and gallery. Trabas has Siering's distant view, and Bing has a satellite view. Located on the outermost of a group of skerries extending southwest from Linesøy. Accessible only by boat. Site open, tower closed. NF-4815; Admiralty L1636; NGA 8344. Date unknown. Active; focal plane 5.5 m (18 ft); white, red or green light depending on direction, 3 s on, 3 s off. 7 m (23 ft) concrete post with lantern and gallery. No photo available, but Bing has a distant satellite view. Located on a skerry just off the east coast of Slåttøy, a smaller island off the southwest coast of Linesøy. Accessible only by boat. Site open, tower closed. NF-4816; Admiralty L1637; NGA 8352. 1924. Active; focal plane 5.5 m (18 ft); white, red or green light depending on direction, occulting twice every 8 s. 7 m (23 ft) square tower with lantern and gallery. Lighthouse painted white; lantern roof painted red. Trabas has Wöhrn's photo, and Google has an indistinct satellite view. Located on a small island about 1.5 km (0.9 mi) southwest of the bridge. Accessible only by boat. Site open, tower closed. NF-4836; Admiralty L1656; NGA 8384. Date unknown. Active; focal plane 30 m (98 ft); flash every 5 s, white, red or green depending on direction. 8 m (26 ft) square tower with lantern and gallery. Lighthouse painted white; lantern roof painted red. No photo available, but Bing has a distant satellite view. 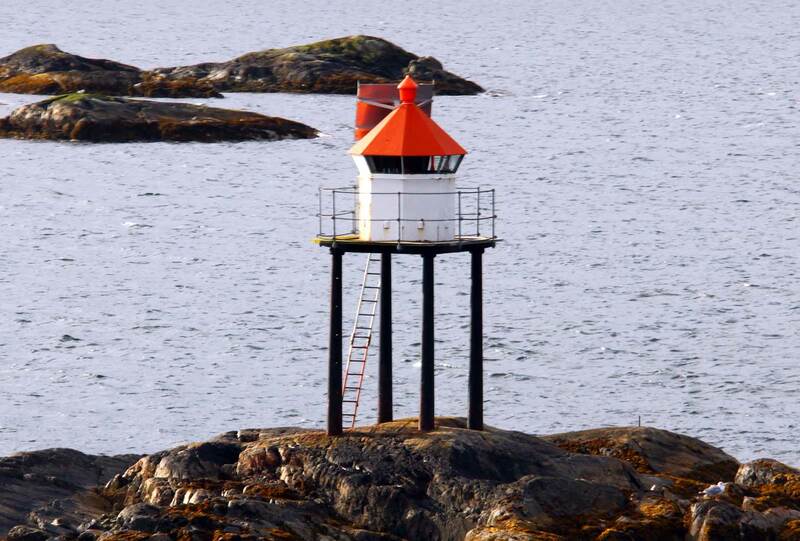 Located on an island about 5 km (3 mi) northwest of Stokkøy. NGA lists this light as Hosenoyene. Accessible only by boat. Site open, tower closed. NF-4848; Admiralty L1670; NGA 8408. 1924. Active; focal plane 7 m (23 ft); white, red or green light depending on direction, occulting twice every 8 s. 7 m (23 ft) square tower with lantern and gallery. Lighthouse painted white; lantern roof painted red. A distant view is at right, Trabas has Wöhrn's closeup photo, and another view is available (second photo on the page), but Google has only a distant satellite view and a very distant street view from the bridge. 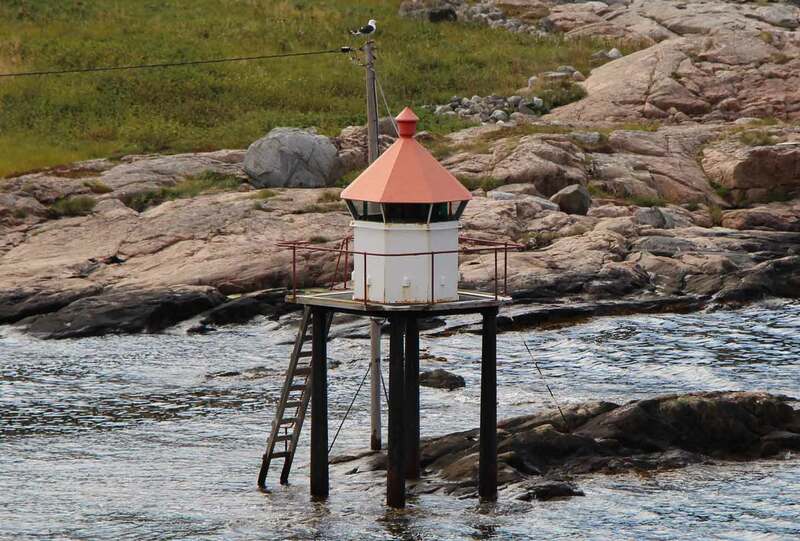 According to the Fyr-i-Fyr site, this is one of Norway's most photographed small lighthouses, because ferries and cruise ships must pass very close to it. Located at the southeastern tip of the island of Stokkøya. Accessible only by boat. Site open, tower closed. ARLHS NOR-421; NF-4842; Admiralty L1660; NGA 8392. Date unknown (station established 1892). Active; focal plane 4 m (13 ft); white, red or green light depending on direction, occulting once every 6 s. 6 m (20 ft) lantern mounted on four straight piles. Lantern painted white with a red roof, piles black. Trabas has Wöhrn's closeup photo but Google has only a distant satellite view. 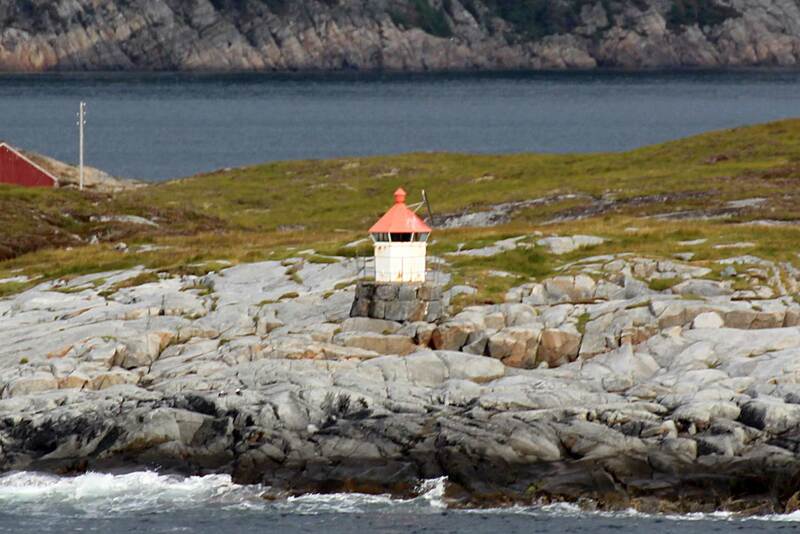 Located at the narrowest point of the Stokksund about 600 m (3/8 mi) northwest of the Stokkneset light. Accessible only by boat. Site open, tower closed. ARLHS NOR-420; NF-4844; Admiralty L1664; NGA 8400. 1897. Active; focal plane 7.5 m (25 ft); white, red or green light depending on direction, occulting twice every 8 s. 5.5 m (19 ft) stone cairn with lantern and gallery. Lantern painted white with a red roof. Trabas has Bash's photo and Bing has a distant satellite view. 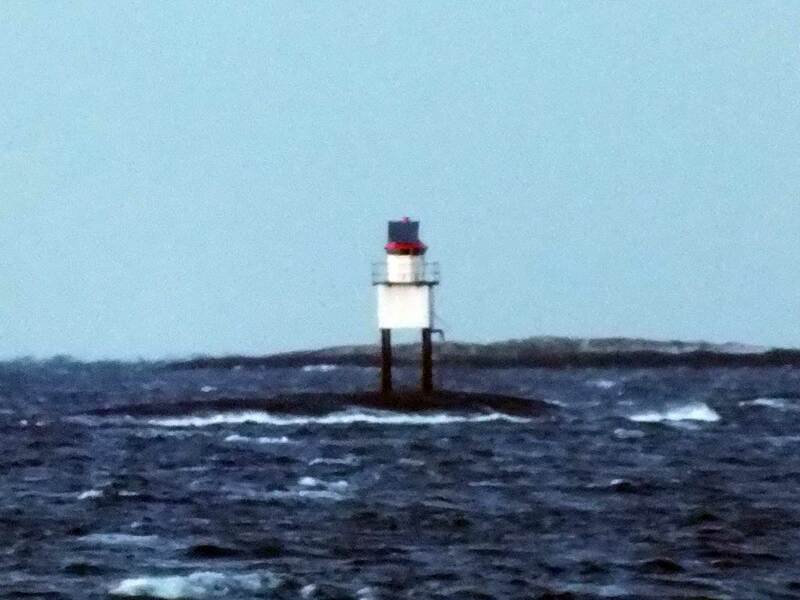 Located on a skerry about 1 km (0.6 mi) west of Brandsøya. Accessible only by boat. Site open, tower closed. NF-4852; Admiralty L1674; NGA 8416. 1931. Active; focal plane 30 m (98 ft); two flashes every 10 s, white, red or green depending on direction. 22 m (72 ft) round cylindrical cast iron tower with lantern and gallery, incorporating keeper's quarters, mounted on a round stone base. 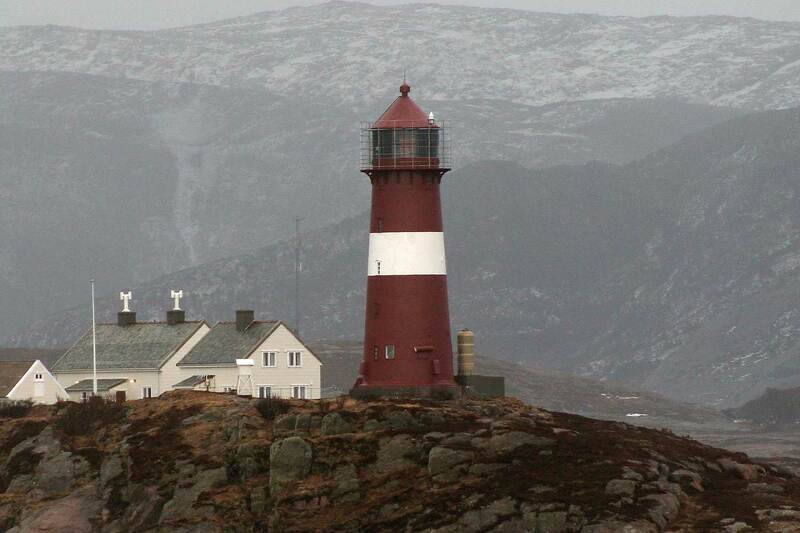 Lighthouse painted red with one narrow white horizontal band; stone base painted white. A concrete boathouse is connected to the lighthouse by a concrete bridge. Trabas has Boucher's photo (also seen at right), and Google has a satellite view. 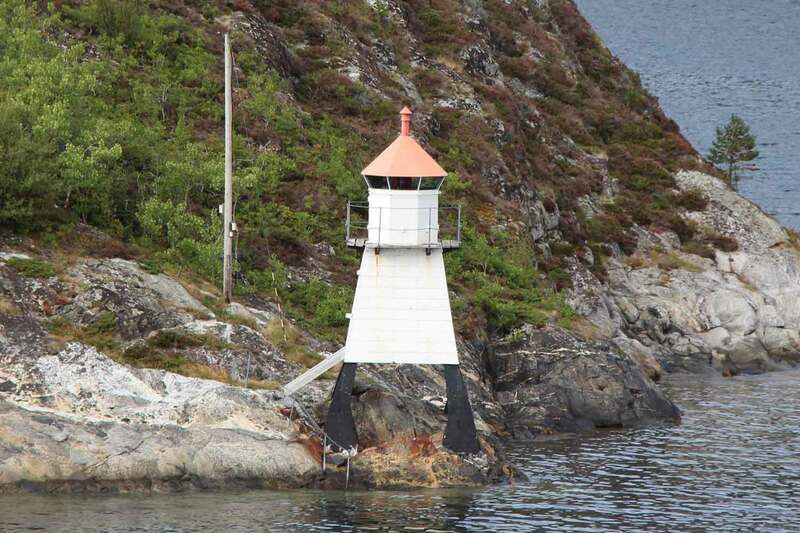 This design is the closest thing in Norway to the "sparkplug" cast iron lighthouses of the U.S. Sibling of Kya Fyr. Located on a small skerry in the Norwegian Sea about 6 km (3.5 mi) northwest of Roan. Accessible only by boat. Site open, tower closed. ARLHS NOR-135; NF-4858; Admiralty L1682; NGA 8432. Date unknown. Active; focal plane 7.5 m (25 ft); white, red or green light depending on direction, 3 s on, 3 s off. 4.5 m (15 ft) lantern mounted on a stone base. Lantern painted white with a red roof. Trabas has Wöhrn's photo, and Bing has a distant satellite view. 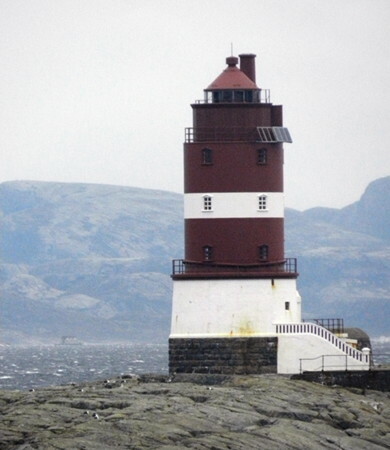 Not to be confused with the well-known Terningen lighthouse on Hitra. Located at the western tip of Terningen, an island on the south side of the entrance to the Bessakersund. Accessible only by boat. Site open, tower closed. NF-4862; Admiralty L1686; NGA 8444. Date unknown. Active; focal plane 12 m (39 ft); white, red or green light depending on direction, occulting three times every 12 s. 7 m (23 ft) square tower with lantern and gallery. Lighthouse painted white; lantern roof painted red. No photo available, but Bing has a satellite view. Located on an island about 1 km (0.6 mi) west of Ytre Skjervøy. Accessible only by boat. Site open, tower closed. NF-4871; Admiralty L1694; NGA 8460. 1920. 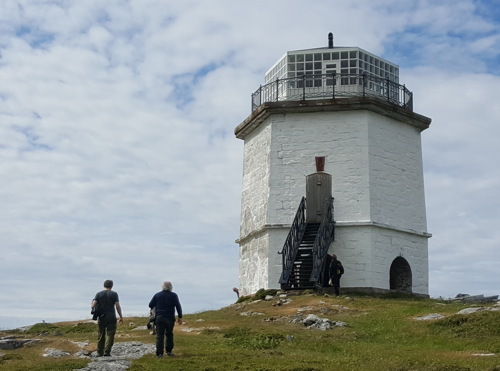 Active; focal plane 29 m (95 ft); white flash every 10 s. 23 m (75 ft) round cylindrical cast iron tower with lantern and gallery, incorporating keeper's quarters, mounted on a round stone base. Entire lighthouse painted red. A photo is at the top of this page, a good closeup is available, Trabas has Boucher's very distant view, and Bing has a satellite view. 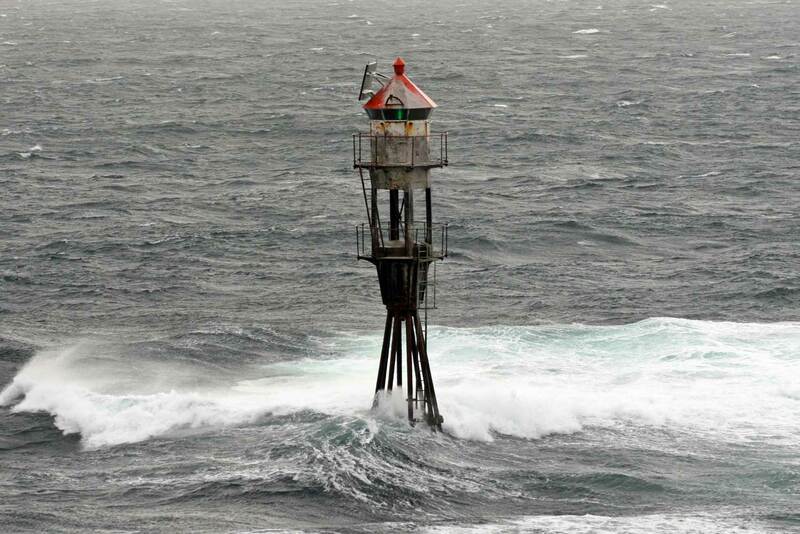 Not to be confused with another, less well known lighthouse in Frøya. 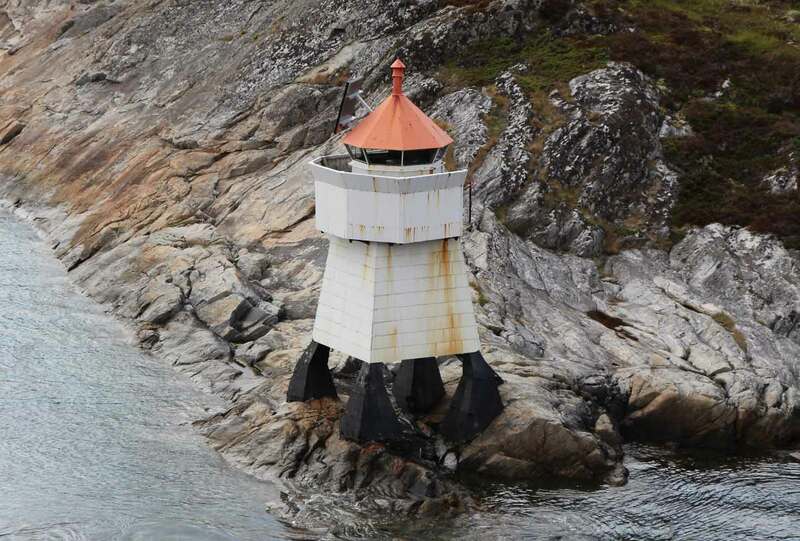 This is one of the most exposed lighthouses of the Norwegian coast, and despite its sturdy stone base it has suffered repeated storm damage over the years. It was a very difficult assignment for lightkeepers until the lighthouse was automated in 1958. Located on a tiny islet in the Norwegian Sea about 16 km (10 mi) northwest of Sandviksberget. Accessible only by boat. Site open, tower closed. ARLHS NOR-147; NF-5000; Admiralty L1722; NGA 8548. Date unknown. Active; focal plane 14.5 m (48 ft); white, red or green light depending on direction, 1 s on, 1 s off. 7 m (23 ft) square tower with lantern and gallery. Lighthouse painted white; lantern roof painted red. No photo available, and Google has only a distant satellite view of the location. Located on the north point of Søre Raudøy, about 4 km (2.5 mi) southwest of Sætervågen. Accessible only by boat. Site open, tower closed. NF-4891; Admiralty L1716; NGA 8508. Date unknown. Active; focal plane 7.5 m (25 ft); white, red or green light depending on direction, occulting once every 6 s. 6.5 m (21 ft) lantern mounted on a platform supported by four straightpiles. Lantern painted white, lantern roof red, piles black. No photo available, and Google has only a distant satellite view. Located at the end of the main breakwater mole of Sætervågen, a village about 2.5 km (1.5 mi) southeast of the Buholmråsa lighthouse. Accessible by walking the pier. Site open, tower closed. NF-4885; Admiralty L1708; NGA 8500. Date unknown. Active; focal plane 7.5 m (25 ft); white, red or green light depending on direction, occulting three times every 12 s. 8.5 m (28 ft) lantern and gallery on a short skeletal tower mounted on piles. Lantern painted white, lantern roof red. Trabas has Bash's photo, but the light is barely visible in Google's distant satellite view of the area. 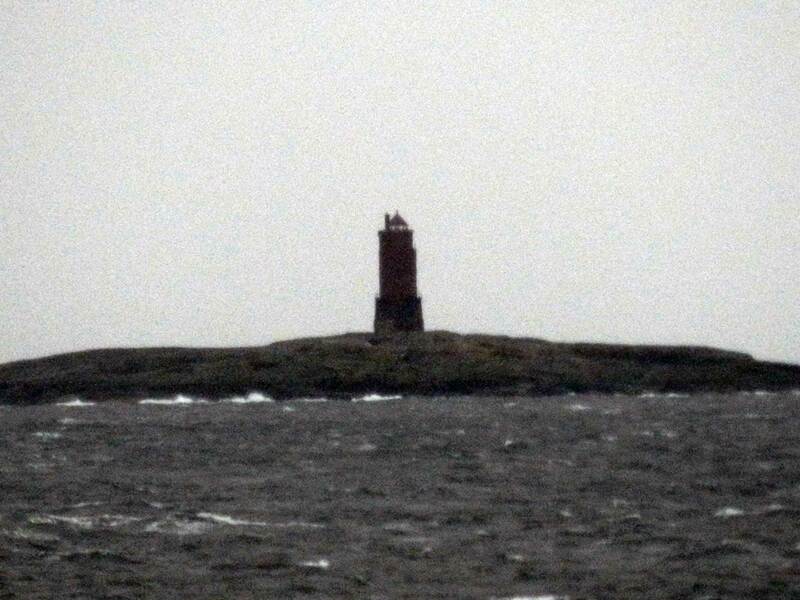 Located on a skerry about 1.5 km (1 mi) west of the Buholmråsa lighthouse. Accessible only by boat. Site open, tower closed. NF-4896; Admiralty L1718; NGA 8520. 1917. Active; focal plane 36 m (118 ft); white, red or green light depending on direction, occulting once every 6 s. 23 m (75 ft) round cast iron tower with lantern and gallery, painted red with one white horizontal band. Two 1-1/2-story keeper's houses. A photo by Torstein Lenes is at right, Trabas has Wöhrn's photo, Claußen has a photo, Gunnar Storheim has a nice view from the sea, Bash also has a view from the sea, another good photo is available, and Google has a distant satellite view. The houses are available for overnight accommodations. Air raids during World War II damaged several of the buildings at this station, which marks the entrance to the Svefjord. Located on a small island off the end of a peninsula about 4 km (2.5 mi) north of Sandviksberget. Accessible only by boat. Site open, tower closed. Site manager: Buholmråsa Fyr. ARLHS NOR-063; NF-4897; NF-4897; Admiralty L1720; NGA 8524. Raudøy (1864-1917), Roan southwest of Sætervågen. 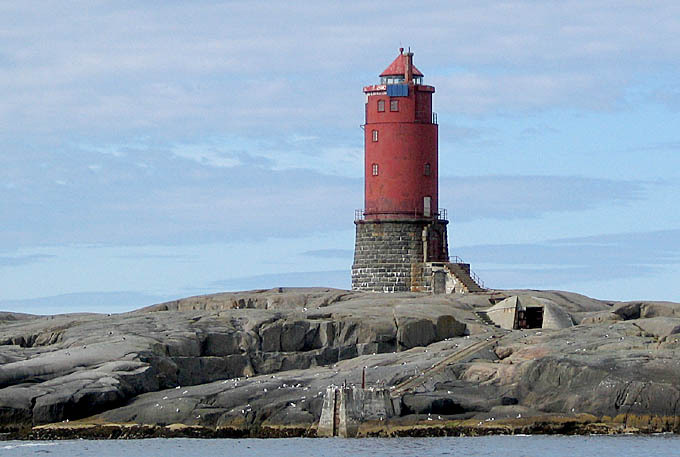 The lighthouse was deactivated in favor of the Buholmråsa lighthouse and subsequently demolished; only foundation ruins remain. ARLHS NOR-196. Posted August 3, 2006. Checked and revised July 23, 2018. Lighthouses: 30. Site copyright 2018 Russ Rowlett and the University of North Carolina at Chapel Hill.